When you hear yodelling you would think Holland, or The Netherlands as it likes to be known. That sound made a fleeting glimpse into pop music in the sixties courtesy of both Frank Ifield and, to a lesser extent, Karl Denver. 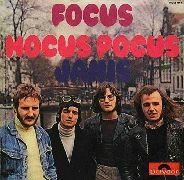 It cropped up again in a flash in 1973 when Dutch prog-rock band Focus descended upon us, like magic, with Hocus Pocus. What’s always puzzled me, is that Hocus Pocus entered the chart on week ending 20th January 1973 and the follow-up, Sylvia, entered a week later, both songs peaked on week ending 24th February and got to numbers 20 and four respectively. I assume their label, Polydor, wanted to strike whilst the iron was hot. They formed in Amsterdam in 1969 and comprise mainly of vocalist, flautist and keyboard player Thijs Van Leer and guitarist Jan Akkerman with an ever-changing line up of bass players, drummers and various other musicians. They got their break when they were asked to play for the Dutch production of Hair and then they began touring locally performing cover versions of A Whiter Shade of Pale and Nights in White Satin as well as a number of original songs written by Van Leer. The majority of their output is instrumental apart from an array of odd noises and a bit of yodelling from Van Leer as well. Although Hocus Pocus was the smaller of their two hits, it is the most well-known especially when it was brought to a new audience in a slightly remixed form when it was used for the TV trailer for the 2010 World Cup and thus crept back onto the chart where it spent one week at number 57. The band had called it a day on more than a few occasions but keep reforming with a varying line-up. The first split came in 1978 with the first reformation coming in 1990, then again in 1997. Van Leer has kept it going since 2002 still with van der Linden on drums, the other two current members are guitarist Menno Gootjes and bassist Udo Pannekeet. Their last album, The Focus Family Album, was released in September 2017 and included extensive unreleased and new material and they are currently lining up a European tour for 2018.